Our entire lives, we are told what to do by other people. As a kid, you answer to parents, teachers, and principals. While many go off to college at 18 and experience quite a bit of freedom, others decide military service is the path to go. Bootcamp isn’t an easy adjustment, and I’d argue that the Marine Corps’ is the hardest, no contest. Upon deciding on the branch of service, some decide to go into the infantry… the grunts. Oftentimes, the infantry feels like an endless bootcamp. Adherence to “instant willingness and obedience to orders” is paramount in combat, so it almost makes sense why it feels that way. You do your time, serve our country honorably, all the while you answer to somebody. Finally EAS (end of active service for you civilian types) comes around and you count the days to “freedom.” You drive off base and you’re free at last. You go home and start over. You get a job and have a boss you have to answer to – starting the entire process over again. You’re free for only a short while, and you realize that while things have significantly changed, it’s still kinda the same. In the infantry, there’s no denying that you’re told what to do pretty much all the time; you have very little freedom, and zero privacy. As a boot, fresh to the fleet you have to listen to everybody except the Marines you came to the unit with. It’s almost a game for “senior” Lance Corporals to make your life as miserable as possible, by making you do mundane tasks repeatedly. No matter how you look at it, you’re only free during libo (free time) and even that can be secured by one incident. Finally, a free man again! Or are you? While you get to make most decisions for yourself: when and where to eat, where you work and live, etc. But once you get into school or get a job, you return to being on somebody else’s schedule: on their program. Get to class by certain time, or make it to work on time. Eat lunch when you’re allowed to on “your” lunch break set by the boss. You have to request off if you have things to do in your personal life. Even though you’re out of the military and a “free man,” you still answer to somebody. After years in the military, then going to school and working for other people, I decided it was time to join my wife in our own business venture; truly a free man. No longer answering to any other man, working for one’s self is a freeing experience like no other. Wake up when you see fit, work at your leisure, take as many breaks for however long. It’s surreal in the beginning, I’ve never experienced this type of freedom. I can literally do as I see fit. Mostly, though, I choose to work, knowing that success or failure rests on my shoulders. 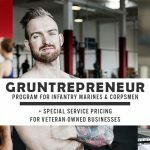 (Gruntrepreneurs) who are trying to start their own venture. We care, we know the struggle, we understand how tough it is leaving the infantry and finding a new profession to replace the lifestyle.